In 2012 the number of stillbirths in the West Midlands, Yorkshire and Humber and the North East of England dropped for the first time in 20 years due to the introduction of customised growth charts and growth assessment training by the Perinatal Institute. Since then the stillbirth rate for England has continued to drop year on year. The Perinatal Institute has estimated that if every hospital adopts their award winning Growth Assessment Protocol Programme (GAP), and a similar stillbirth reduction was achieved across the UK, 1000 stillbirths could be prevented every year! Watch our short video to learn about the benefits of GAP. Interviewees from the Perinatal Institute include Professor Jason Gardosi, Director and Sue Turner, GAP lead and Supervisor of Midwives. All babies are made to measure as mums’ bodies are unique. For example, European mums have bigger babies than Asian mums, and taller mums have bigger babies than smaller mums. Because all babies are different it is important that we take this into account when monitoring babies’ growth during pregnancy. However some hospitals do not take into account these variations when monitoring fetal growth. Customised growth charts are generated using software which takes into account a mum’s ethnicity, weight, height and how many babies she has had to produce a bespoke growth chart for midwives to use in the antenatal notes. The Growth Assessment Protocol (GAP) is a programme by the Perinatal Institute which improves detection of growth restricted babies through the use of customised charts alongside training, protocols and audits. Between 10-15% of babies born are growth restricted and the majority of these go undetected. By detecting these babies we hugely increase their chance of survival. Provision of customised growth charts and birthweight centiles via specialised software (as recommended by RCOG guidelines). Extensive training package and competency document for midwives, obstetricians and ultrasonographers which includes information on: fetal growth restriction and its association with stillbirth, risk assessment, principles of increased and low risk care, standardised measurement of fundal height, use of customised growth charts and much more. Template protocols reflecting latest available evidence and guidelines. Data collection tool which provides local reports on rates of growth restriction and detection, so that units can monitor their own performance and compare themselves against the national average. Tool to audit cases where growth restriction has been missed in order that units can learn from these incidents. And the cost for each trust? Just 50p per pregnancy! Evidence suggests that running GAP is cost neutral and pays for itself. More information about GAP including research around the benefits can be found on The Perinatal Institute website. You can also read how GAP is reducing stillbirth in this BMJ Open article. Is your hospital on board GAP? Since 2013, GAP has been adopted in two thirds of the UK’s maternity units. Here’s a list of who has already adopted GAP. If your hospital hasn’t yet introduced GAP, email your Head Of Midwifery a link to this web page and encourage them to call The Perinatal Institute on 0121 607 0101 to find out how to enrol on the GAP programme. You can also print our Made to Measure flyer to give to your maternity team. NHS England recommends the GAP programme as part of their “Saving Babies Lives care bundle for the reduction of stillbirths and neonatal deaths”. 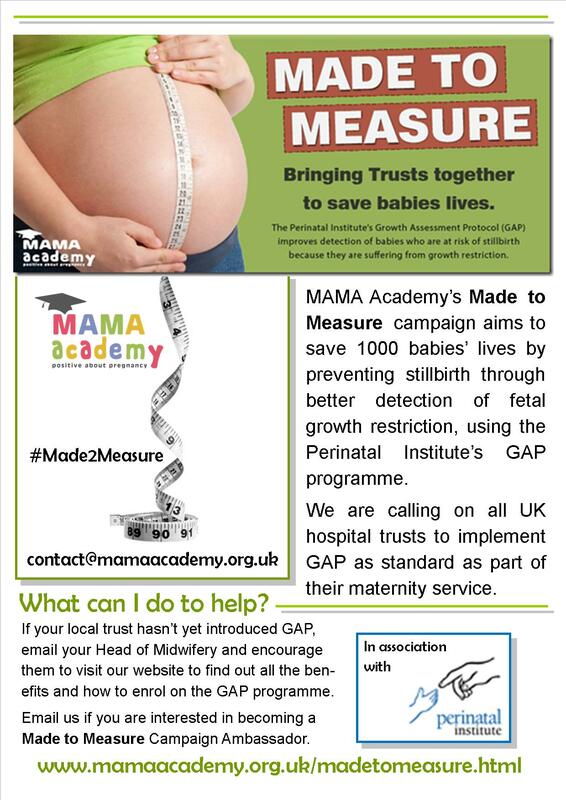 If your baby was affected by fetal growth restriction, we would love to add you to our list of case studies for media requests so please email us a summary of your experience to contact@mamaacademy.org.uk. You can also sign our petition asking all Head’s of Midwifery to adopt GAP in their maternity unit. If you would like to get involved as a campaign ambassador, please email us so we can update you on opportunities in your area. Please include which town and the constituency you live in. We look forward to hearing from you. Thank you for supporting our Made to Measure campaign to save babies lives. A very special thank you to The Perinatal Institute for the incredible work they do.